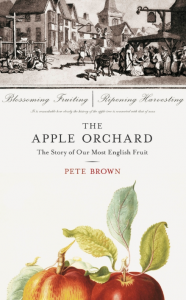 Pete Brown’s new volume of entertaining investigation into the social history of a subject dear to his heart looks at apples and the orchards in which they grow. Anyone who has read any of Pete’s other books – I’ve hugely enjoyed all of his beer- and pub-themed works to-date, including Man Walks Into a Pub, Hops and Glory, and Shakespeare’s Local – will know what sort of reading experience to expect. His style is highly readable; he knows just how to keep the narrative moving along at a decent clip, dropping in historical facts, amusing asides and moments of personal insight with equal measure, but never allowing them to clutter up the prose or divert the flow for too long. The Apple Orchard is true to form: a healthy mix of well-researched social history, pithy observation, personal discovery and plenty of humour. In The Apple Orchard, Pete turns his attention to that once essential but now, sadly, much-diminished feature of the English landscape. Following the apple tree through the cycle of the year – beginning with the blossom of Spring and ending with a dose of deep-winter wassailing at a cider farm – he examines the humble fruit from perspectives as diverse as modern orchard management, cider production, mythological tropes from the garden of Eden to the Isle of Avalon, apple genetics, historical reasons for the decline in English orchard acreage, current reasons why we see so few varieties on supermarket shelves, tree grafting, proper pruning, the vital importance of European seasonal migrant labour to the UK apple industry, the many and varied benefits of the aforementioned wassailing, the key role in the whole process played by the ancient art of morris dancing, and a whole lot more. The finished product is a heart-warming love-letter to a way of life that seems to have disappeared from all but the most die-hard apple-producing parts of our green and pleasant land. It’s a very personal exploration, rather than a detailed historical document, or technical analysis of modern apple production methods. It wanders, it meanders, it pokes around in dusty corners, turning up odd facts of interest and uncovering lost gems of once-common knowledge – think QI or Time Team, rather than Timewatch or Panorama – and it’s all the more enjoyable for it. At times Pete seems genuinely astonished by some of the information he uncovers, as he comes to realise that a thing as simple and ubiquitous as the apple lies at the core of a hugely rich history, with a massive impact on the cultural development of humanity, and a state-of-the-art production industry that turns out all the millions upon millions of crisp, red-and-green specimens that are demanded on our behalf by the supermarket buyers. As a reader, I couldn’t help but be similarly amazed and delighted by those same discoveries and, like the author himself, I came away from the book more than a little in love with the whole concept of the orchard. On finishing the book, I found my head spinning with mad ideas of moving to the West Country and taking up fruit tree management as a new career. Instead I’ll have to content myself with the few potted trees I have on order from the National Collection at Brogdale – a place mentioned often in the book and much-lauded for its work on preserving apple diversity and developing new strains of fruit – and look forward to gently (and quietly) Wassailing them in our small back garden in years to come. Mr. Brown, I couldn’t agree more. I highly recommend The Apple Orchard to anyone with an interest in apples, orchards or English social history, as well as any and all fans of a light but highly informative read that will leave you craving a Crawley Beauty (they’re a late variety, should be ready for eating around now, if you can find any) and a long walk through an apple orchard next blossom season. Definitely for every gardener’s Christmas list, birthday list and ‘dammit, I deserve a good book’ list. * = affiliate link – if you buy the book from here I’ll earn a small referral fee, which will go towards my next gardening book or packet of seeds.